The two houses known as 33 and 35 St Mary Street are the two grey three storey houses in the photo shown on the left. This photo was taken in the early 1960’s. Click on the thumbnail on the right below to see the view of the top end of the street. We would love to hear from anyone who has any other photos! In the 1840 Tithe Survey there were three houses where 33 and 35 once stood. It was then Plot 136, owned by George Cossham. It is worth noting that there is a reference to an earlier George Cossham owning property in St Mary Street which could be the same property. In the Will of George Cossham dated 1785 he left his son Benjamin ‘a tenement in Back Street otherwise St Mary’s Street where Henry Burnell and Sarah Motley now dwell purchased of (space) Whitehead. The 1840 Tithe Survey shows that number 33 St Mary Street was occupied by John Burnell, the son of Henry Burnell and his wife, Hester. Is it possible that Henry’s family lived in the same house for 50 years? If so, then it might point to the earlier ownership of the three houses. George Cossham – George was born about 1794, the son of Jesse Cossham, a carpenter and his wife, Ann (nee Child). According to Scribes Alcove website George Cossham married Mary Sperrin on 13th March 1834 in Thornbury. In 1841 census George was living at 60 High Street – he was a grocer aged 45 living with Mary aged 44 and Elizabeth Hollister a female servant aged 14. The 1851 census shows them in the same house – George is described as a landed proprietor aged 46 from Thornbury, Mary a provision agent aged 55 from Nailsea. Esther Bishop is also living in the house and working as an assistant in the shop. She is described as ‘niece of wife’ aged 12 born in Bristol Cathay. The 1859 rate book shows George as owner of the three properties. In 1861 Mary is living there – the census page is very spoilt but it appears to show she is a land proprietor born in Dundry. The 1871 census shows Mary as a retired shopkeeper aged 76 born in Dundry living with Agnes Sargent a domestic servant aged 13 from Thornbury and a lodger, Harriett Harvey an unmarried dressmaker aged 54 from Banwell in Somerset. A newspaper report dated 17th April 1871 possibly explains George’s absence. It reports on his death in 1871 saying that George was a retired carpenter who had for many years been confined in Gloucester Lunatic Asylum. Several years before his death, in pursuance with his wife’s wishes, a coffin had been made for George and this had been lying in the undertaker’s awaiting the time it was needed. The grave was also prepared in advance of his death. George was buried in the Baptist Burial Ground. In the 1876 rate book the houses were owned by Mary Cossham. The book was still listing three houses, although two of these were void. Mary died in 1876 aged 81, and the houses were acquired by George Walker. The 1880 rate book shows three houses owned by George Walker. All three houses were void and we suspect that around this time the three houses were replaced by two. The 1885 rate book and subsequent books list only two houses owned by George Walker. George Walker – the 1885 rate book shows George Walker was the owner of the two houses. An indenture of 24th June 1898 refers to the fact that George was “seised of the hereditaments …..for an Estate of Inheritance.” At this point we do not know how he inherited the property. Robert Withers – the 1905 rate book shows that ownership of number 33 St Mary Street was acquired by R. Withers. We think this must be Robert Withers who was living at the Castle Coffee Tavern in the High Street in 1901 census. Robert was born about 1867, the son of Thomas Withers, a tiler and plasterer and his wife, Isabella who were living at Crossways in the 1891 census. In 1891 Robert was a gardener (domestic servant), but by 1901 he was described as ‘letting traps for hire etc’. In 1901 he was living with Caroline Elizabeth Butler, who had recently taken over as manager of the coffee tavern following the death of her husband in 1899. Robert and Caroline had one son, Charles born in June quarter 1901 before Caroline committed suicide on 11th September 1901 leaving Robert to bring up Charles. The 1926 rate book shows the house was still owned by the ‘representatives of R. Withers. We don’t know what happened to the ownership of the house. On 3rd July 1959 Clifford Neville Pimm of Holly Bush, Almondsbury sold 33 St Mary for £50. The new owners were Donald Walter Pearce, who traded as a butcher at 4 The Plain, and Roland William Pearce of Florence Park, Almondsbury, garage proprietor. The documents held by South Gloucestershire Council for this house contain a declaration by Roland William Pearce that the original conveyance and documents relating to the house were in his safe in “The Quest” in Florence Park but were stolen! 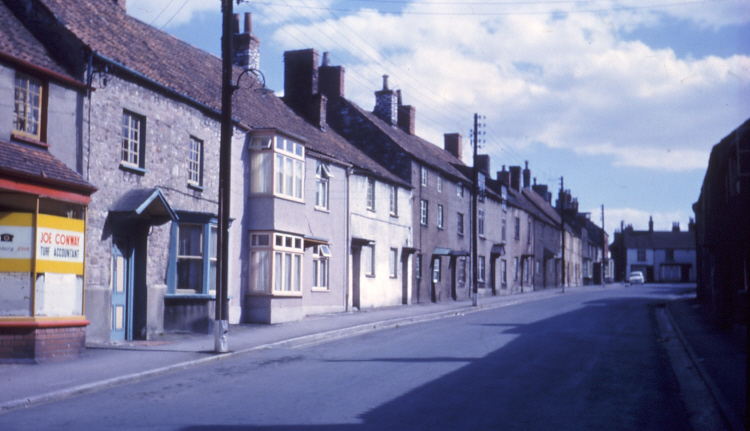 In 1961 the house was then sold under a compulsory purchase order to Thornbury District Council for £60. The property was demolished and the site used for the building of a new library. Clement and Beatrice Louise Williams – an indenture dated 18th July 1921 shows that 35 St Mary Street was sold by Miss Ellen Jones to a labourer called Clement Williams. Ellen Jones was the sister of Frederick Jones. An indenture of 11th August 1924 shows that Clement Williams sold 35 St Mary Street to his wife Beatrice Louise Williams for £90. In the 1926 Rate Book it still indicates that number 35 was owned by Clement Williams. Beatrice died on 5th Janaury 1928 and by Letters of Administration to the Estate of Beatrice Louise Williams 35 St Mary Street was left in two equal shares to her sons Francis James Phillip Williams and Clement Oswald Williams on 6th November 1929. They were both living in the property at that time. A conveyance dated 31st of May 1963 explains that Francis James Phillip Williams died 23rd April 1963. A new trustee Anthony John Collins was appointed with Clement Oswald Williams to settle the estate of Beatrice Williams. The address of both trustees was given as 14 Buckingham Parade in Thornbury. A compulsory purchase order empowered Thornbury Rural District Council to acquire 35 St Mary Street to build a new library. The house had been demolished by this time and the Council paid £60 for the land.